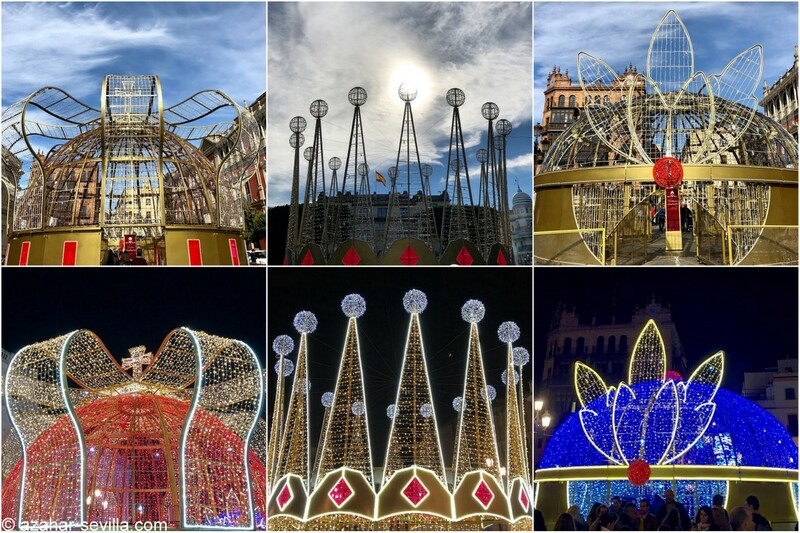 The three crowns in Plaza San Francisco, by day and by night. As a freelancer I don’t really experience Mondays like many of you do, so I tend to enjoy it as much as any other day. In fact, I often have to think about what day it is because things like public holidays and weekends don’t really exist for me. But I have to say this was an exceptional Monday! I had plans to meet my friend Juan for a late lunch, so made sure to get all my online work done in the morning. It has been ages since we’d seen each other and it was great catching up over a few pintxos at recently opened Orio. This timed perfectly with meeting up with Jo after lunch, who was passing through town on her way back to London with a few hours to spare before her flight. So we met first at the Hotel Alfonso XIII (see gorgeous tree above) for an overpriced drink, before heading to La Azotea for a penúltima (below). I had also made plans to meet up with Peter to see the “light show” in Plaza San Francisco and it turned out that Jo had time to join us. I took a video of this for an Instagram story, which has now disappeared, but here you can see what the crowns look like. It’s actually a very nice display this year. Afterwards Peter and I said goodbye to Jo and headed to our respective homes. Such a lovely day full of friends, food and Christmas lights.